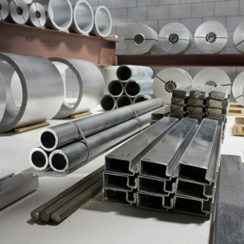 Stainless steel is divided into five basic categories: Austenitic, ferritic, duplex, martensitic & precipitation hardening. When selecting the right grade, you must take into account the environment in which it is to be used, your structural requirements, life of the structure and the required surface finish. Although the initial costs of using stainless steel can be high, the long term benefits can’t be ignored. Its longevity reduces the need for repairs and replacements and so saves on future energy consumption. Plus, at the end of its life, stainless steel is 100% recyclable. Perforated stainless steel metal sheet is perfect for a number of applications. It is used extensively in the building trade as well as for architectural purposes such as balustrades, gangways, stairs and screening. There are also a number of industrial uses for perforated stainless steel and metal sheet including ventilation, filtration, sorting tables, acoustic panels and anti-slip flooring. Stainless steel extrusions can be solid sections, bars or rods and often feature complex profile shapes ideal for a variety of uses. Extrusion is a deformation process where stainless steel is forced to flow by compression through a die with an opening of a smaller cross-sectional area than the original metal. Whatever your stainless steel needs – perforated stainless steel, perforated metal sheet or stainless steel extrusions – we’ll source it for you. Call us on 0800 0113 091 or email us.